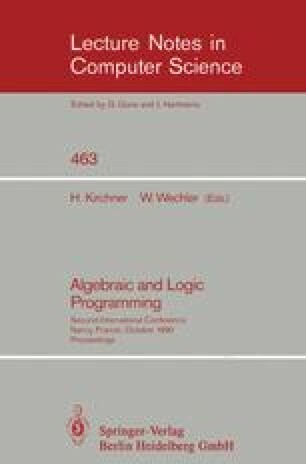 Conditional Equational Programming is an elegant way to uniformly integrate important features of functional and logic programming. Efficient methods for equation solving are thus of great importance. In this paper, we formulate, and prove sound and complete, an equation solving procedure based on transformation rules. This method achieves a top-down, goal-directed strategy based on decomposition and restructuring, while preserving the advantages of both basic narrowing and normal narrowing. Another new feature, introduced in this paper, is the extension of equation solving to theories with defined functions that are associative and commutative, without using the costly AC-unification operation. This method has been implemented within SUTRA, a theorem proving and equational programming environment based on rewrite techniques and completion. 1.Department of Computer ScienceUniversity of IllinoisUrbanaU.S.A. 2.Department of Computer ScienceUniversity of DelawareNewarkU.S.A.